So Kates has parent/teacher conferences tonight. Which means I’m flying solo with Phoebe. I got her fed. Watched her shove peas into her mouth by the handfuls, along with a mix of some pieces of turkey and rice, while I sat alongside her eating a cheeseburger Hot Pocket and the leftover peas. We played. And played. And played some more … As usual, our living room floor was littered with toys and gadgets by the end. And then, when the yawns got wider and longer, and her legs were so wobbly she could hardly pull herself up, we began getting ready for bed. At 7 o’clock, right on schedule … Changed her into pajamas, let her play some more in her room, read a couple books and then gently slipped her into her crib about 20 minutes ago. Yep, I did well. A pretty good night. I locked her in the car this afternoon as we were leaving the daycare -- with my keys inside the car. See, Phoebe loves to grab and play with our keys as we’re walking from the house to the garage, the garage to the house, getting into the car, wherever. When she sees the keys in our hands, she takes hold. So this afternoon, I was leaving the caretaker’s place and Phoebe grabbed my car keys as we got to the car. And just before I was about to strap her into the car seat, she pressed the automatic lock button. I heard the car horn signaling all the doors had been locked, but it didn’t faze me. Following my usual routine, I took the keys from Phoebe’s hands, tossed them in the front seat for me to pick up when I got back in the driver’s seat, and I strapped Phoebe into her car seat. Meanwhile, Phoebe’s in her car seat flapping her legs and smiling away. Back inside I went. Told our caretaker what had just happened and she grabbed a phone to call police. Apparently, they're quick to the scene whenever a child is locked in a car. Great. I’m going to be writing about myself in tomorrow’s police reports. While we waited, the other kids joined me in standing outside the car, delighting in the sight of Phoebe looking back at us, still smiling and kicking in her car seat, having absolutely no idea what her father has just done ... And as the other mothers arrived to pick up their toddlers and heard my story, the stories poured out of their experiences locking children in the car. Great. So I’m part of an exclusive club now. Within a few minutes an officer pulled up. He got out of his car and sauntered up the driveway with a smirk on his face. “All right, whose fault is this?” he asked. “It was me. The proud father,” I confessed. The officer peeked in the car at Phoebe -- who was, yes, still smiling and kicking. “License and registration, please,” the officer said to her. The officer then looks back at me and proceeds to tell me he’s going to try to unlock my car for me, but the police department is not liable for any damage caused to my car in the process, and that he’s unlocked hundreds of cars without having to break into one, but he needs to make sure I understand that I can’t hold him responsible if he has to smash a window. “Yes, I understand that,” I said, and he turns back toward his car to retrieve his tools. Please don’t break my window. The officer returned with a long pink wire that had a hook on the end of it. Then, as me and a couple of the boys watched from the driver’s side, he extended the wire inside the car like a surgeon. He put the hook right under the locking switch and pulled up. Like magic, he’d unlocked the car. “There you go,” the officer said. He folded up his equipment and started back toward his car while I erupted in a thankful smile. “Phoebe’s never playing with my car keys again,” I told the others as I got into the car. Like I said, it was a fun night with the little one. So I took a detour. And I drove along the lakefront -- one place I certainly didn’t imagine I’d be six years ago when I bought her. I watched as it hit all nines -- and then 100,000 … Unfortunately, now I’ve just realized I didn’t document the song on the radio at the time of the milestone. Dang. I drove her off the lot in December 2001, fresh out of college, with just 17 miles on her. She was my dream car at that time … And I put more than 23,000 miles on her in just our first 10 months together. That was because I was taking her on a two-hour trip to Chicago to visit Kates every other weekend, on top of a few three-hour trips to Pine Lake … Just think, at that pace I should’ve hit 100,000 in about half the time. We’ve had two or three minor collisions -- all caused by opposing careless drivers. Luckily all of them were so minor, none caused a dent or scratch … In fact the most severe injury was that freak stone that fell from an aqueduct a few summers ago. 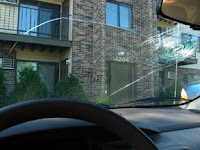 It shattered my windshield while I ducked for cover, thinking I was being shot at. Scared the crap out of me. Until last year, she was our “nice car.” Our expanding family changed all that, of course … Now, she's been relegated to mostly just being my work car, which I suppose is probably good for her health. We’ve been to Kansas City and back a half dozen times. And Chicago at least twice as much. And Milwaukee. And to St. Louis. Through Indiana and to Toledo. And packed like sardines inside her en route to camping trips. We've driven through awful rain storms. And pushed through 2 feet of snow. And now I'm driving her through the city every morning with my 1-year-old daughter strapped in the back seat. We've come a long way, baby. Er, Bobby. Having seen this last night, I'm convinced this might be one of the coolest plays in baseball. When Jacoby took off I just stood and watched, jaw dropped and mesmerized by what he was pulling off. This is one of the most fun, entertaining things I've read in a long time. Probably because it has to do with Twitter. And baby behavior. And these tweets are totally things Phoebe would write. Seriously. Was there any doubt last night that Lil and Anoop -- the most overrated Idol contestants in the history of my Idol-watching -- were going home? Ok. Maybe there was one teenie, weenie moment of doubt that Allison might go when Ryan Seacrest did his dramatic stall-until-the-last-possible-second-before-TV-viewers-need-a-bathroom-break thing. Man, I hate that. After Tuesday's round of disco performances, it's clear Adam Lambert and Kris Allen will be facing off in the final. Actually, I thought Kris got the better of Adam this week with his sweet take on Donna Summer's ''She Works Hard for the Money.'' The bongo-guitar arrangement totally sounded like a mash-up of a Jack Johnson song and the Doobie Brothers' ''Long Train Runnin''' — which, yes, Slezak, should be titled ''Without Love'' — and I liked it! On the other side, I thought Adam's version of ''If I Can't Have You" was just ok. But his voice still soars. And for the rest of them: I'm willing to bet viewers are getting tired of Danny Gokey. No way he's got, what Paula called, the "sexiest voice ever." I like Allison, and I really liked her arrangement of "Hot Stuff." But she doesn't stand a chance against Adam and Kris. And Matt, while I was totally glad to be swept up in the joy of his save last week, he's in the same boat as Allison. a 'Idol' loses some flash this season ... The emergence of a clear front-runner has sucked a lot of the drama out of the show. At this stage, it's hard not to view this season of "Idol" as Adam Lambert versus everyone else. a Susan Boyle: America, what's your problem? a Why can't America have 'Britain's Got Talent'? And before we know it Phoebe's flipping peas over her shoulder onto the kitchen floor. But the music playing on the iPod always makes it ok. I was checking up on their goings-on the other night, and I caught this interview with them. Good stuff. They're tops on our list right now of bands we want to see. Now if only they'd come to a theater near us. No walking yet. But she crawls at the pace of a racehorse. She’s got waving down pat now, and she loves doing it whether Kates and I are leaving her or not. If I hand her off to Kates, she’ll wave good-bye. “Yep!” she said. And she crawled away. I’ve revised “About Me,” and added “The Lists” -- a hub for all the lists I’ve created during the life of this blog. More of the Web sites and blogs I enjoy reading also are constantly being added and subtracted at the sidebar on the left. Monday, we were exhausted from our whirlwind weekend of preparing and celebrating Easter and Phoebe’s first birthday … At my workplace it seemed as though every other business in the city was closed for some post-Easter recovery. And every other person had fled the city because the schools were on spring break. … In our office, we were working with a bare bones staff and an editor who was there only for the morning hours before taking off on his own vacation … I was following up on a handful of serious incidents from the day before. I was stuck dealing with the bottom rung of staff from the agencies involved because all of their superiors were on their vacations. Terribly frustrating. Tuesday, with a good chunk of our money going to taxes and bills, we were scraping the depths of our bank account and counting down the hours to a pay check on Wednesday. I had been putting off filling my gas tank and was driving on fumes as I took Phoebe to the daycare Tuesday morning. Eventually, I made a pit stop at our house and filled up with a gallon of gas I’d put aside for our lawn mower … Then, feeling anxious and harried, I accidentally bumped the side of Phoebe’s head on the car door as I was getting her out of the car seat and reaching for her bag. She erupted with big tears as I carried her into the daycare and had to leave her; I felt awful … And there was some accident at the daycare involving our provider’s daughter’s weeks-old puppy who fell off a couch and broke her leg. We got a call Tuesday night telling us the daycare was closing on Wednesday while the puppy went in for surgery… Which meant …. Wednesday, Kates and I had to figure out how we would split our work shifts and still take care of Phoebe; both of us needed to be at our jobs Wednesday for varying reasons … I ended up going in at 5 a.m. and coming home at 7 so Kates could go to work and I stayed with Phoebe for the morning. Then Kates came home at noon to finish out the afternoon and I went to work. Thursday was the toughest day yet. Phoebe hadn’t given us a good night of sleep, and once I got to work the action came like an avalanche … First, a scaffolding accident injured a man who fell at a construction site. Then a car crash with injuries that was blocking a major road … And then, just an hour before I was supposed to leave for the day, a tactical unit moved into a neighborhood, blocked off streets and surrounded a home with guns drawn in search of two murder suspects. When I got to that scene, I was bombarded with neighbors who either wanted to know what was happening or who wanted to complain about the authorities sudden sweep and no-nonsense takeover of the neighborhood … When I got back to the office, some of my cohorts were just as bad. Clearly, I was working on a breaking news story, on a deadline, on overtime. Yet, some of them couldn't resist nosing around and crowded over my shoulder as I wrote my story. It was like their first day in a newsroom. You don't do that! … I left work two hours later than usual and was so tensed-up when I left, I could only lie on the couch when I got home and decompress ... Oh, and our daycare provider had to take her son to the emergency room with some weird pain in his side. Let’s hope next week is smoother. And finally an original. Remember when I mentioned the other day that one of Phoebe's new favorite words is "a-daup." Here, she's using it in action as she plays with an outlet and phone jack ... Don't worry, they're baby-proofed. But all of that underscored the sadness of Harry Kalas's passing. And then the shock of Mark Fidrych's death a little later. Phil Rogers has a good take on the day here. The New York Times' Joe LaPointe also has a good take on Fidrych here. If only we knew what it meant. Now, tonight, as we watch her crawl with abandon around our living room and kitchen floors we’re standing back in wonder and amazement that we’re the parents of a 1-year-old. It was one year ago yesterday that she was born. Leading up to the big day on Saturday, we were having a good time recalling where we were as each of the hours passed. Like the euphoria that ensued when Kates water broke at about 4:45 in the afternoon. And then as we headed to bed at about 11 Saturday night that by then Kates had received the epidural and the nurses were telling her to get some sleep because she only had a few more hours. Pheebs was born at 3:44 a.m.. Of course, Kates and I hardly considered waking ourselves or Phoebe up in the middle of the night to mark the time. We won’t do that for at least another 17 years. We started yesterday morning with an Easter egg hunt for Phoebe. 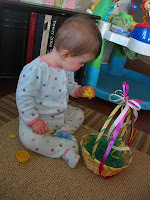 Kates had positioned a handful of plastic eggs throughout the living room with some of Phoebe’s favorite treats inside. Puffs, Cheerios, crackers. …As soon as Phoebe figured out how to open each egg, she was set for the next several minutes picking and placing each bit in her mouth. Then, it was off to our Easter worship. 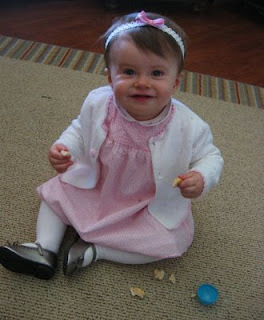 We dressed Phoebe in a springy, pink dress with white dots and a white sweater to cover her arms, and her favorite silver shoes. … As usual, she smiled and delighted every face that greeted her. We had both sets of grandparents and her Uncle Orrin over for the afternoon … When the gift-opening commenced, she got lot of toys, including a Playskool walker that folds into a car from Kates and I, a rocking horse from Orrin and some McDonalds Happy Meal toys from my Aunt Kathy -- which right now appear to be her new favorites. She also got lots of bright, colorful clothes for the summer, and some new stuffed animals that also appear to be a hit. For the Easter/birthday dinner, we had a full entrée of ham and asparagus and mashed potatoes and German potato salad and Jell-o. And then … it was time for the cake. Kates made a chocolate midnight cake with marshmallow frosting. Now Phoebe is a pretty good eater and has shown us she’s pretty willing to try new things. But we were still a little leery about how she might react to the cake. 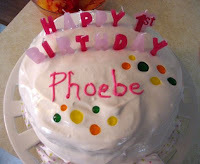 Forget it … Once Kates slid a piece of the cake in front of Phoebe, the birthday girl didn’t even blink. She began slowly, picking small crumbs and putting them into her mouth. But only a few more seconds passed before she was shoveling pieces that were bigger than her little mouth. 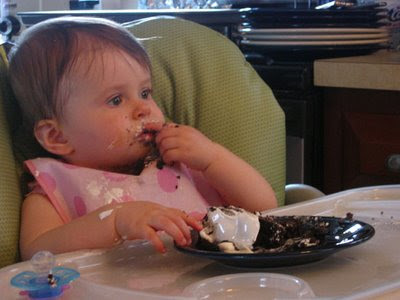 At one point, she tried picking up the entire piece of cake and pulling it to her mouth, only to have some of it fall apart on her bib. After awhile, Phoebe was in a zone, staring blankly ahead as she picked her cake and put the pieces in her mouth as though she wasn’t even thinking about it. Seriously, she wasn’t even blinking. And the area around her mouth was so covered with brown and white cake mix, Orrin started calling her Captain Blackbeard. Phoebe ate every last crumb. Kates took her straight to the tub. And I took to cleaning the dirty dishes and kitchen. And then there are days, like in real life, that I just want to be left alone. I don't care what my friends are doing. 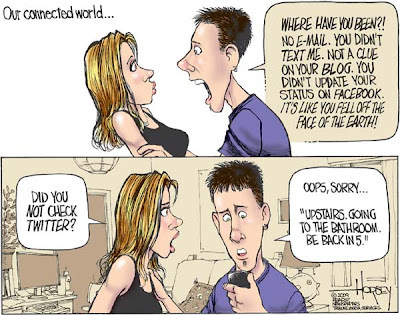 I don't log on. Newspapers are dying, right? Or are they? I don't know. I wish I had the all-saving answer. Every day it seems like another great newspaper is in trouble. And another columnist is pitching a noble idea to get us all turned around. In my view, this downfall has nothing to do with the economy. It's simply the result of an industry slow to adapt with evolving technology. And now he's gone. A terrible tragedy. Last night's 'Office': One of the best in a long time. Great stuff. The news came as no surprise to me. Ol’ Mac’s performance on Tuesday night of “The Search Is Over” was easily the worst of the night. I was surprised to see the judges actually having a hard time deciding whether to save him when he clearly wasn't going to take the top prize ... Like a lot of the songs he picked this season, initially I thought “The Search Is Over” would be a good pick for him. Then he started singing and … aye. He was wearing on me. Danny Gokey started off with that great song from 1980 … Stand By Me!? … Seriously!? Gokey could have found a far better song from that year than a cover version of a song that was a hit in 1961. … I wasn’t feeling it nearly the way the judges said they did. Gokey’s wearing on me, too. Kris Allen came out with 1985’s “All She Wants To Do Is Dance.” … Yeah, wasn’t feeling Kris either. Lil Rounds sang “What’s Love Got To Do With It.” … Didn’t like it. Simon hit it when he called her a second or third rate Tina Turner. Anoop Desai sang “True Colors” … One of my favorite performances of the night. I loved that Anoop picked “True Colors” and he chose the arrangement from Cyndi Lauper’s “Body Acoustic” remake disc. For once I wasn’t hoping Anoop got the boot this week. In fact I was shocked to see him with Scott and Lil in the bottom three. Allison Iraheta picked “I Can’t Make You Love Me.” … Great song. Pretty good performance, although I thought she tried to rock-it-up a little bit too much and that took away some of the tenderness that made the original so good. My third favorite performance of the night. Matt Giraud sang “Part-Time Lover.” … Eh. I didn’t like it near as much as the judges. I really didn’t like the arrangement. I like Stevie Wonder’s original too much. Adam Lambert’s “Mad World” was pure and beautiful. Standing ovation here, too. a Does Lambert vs. Gokey spell curtains for Idol Nation? ... An interesting perspective. The way things are coming down with Gokey vs. Lambert is crazy similar to the way Kates and I were feeling this time last year about Archuleta vs. Cook. a Judging Paula: Has she gotten smarter? Can you IMAGINE being in this train station when this breaks out! I dedicate this one to my mother. 12. God must love stupid people; he made so many! 26. Ham and eggs: A day's work for a chicken, a lifetime commitment for a pig. After Saturday's game I flipped on my computer and checked the office pool standings. There, at the top was my name in a bright, shiny blue hyperlink to what I figured was sure to be my winning bracket. The Spartans advance had given me a solid 200 points. That was my one shining moment. A couple hours later, North Carolina had beaten up on Villanova to set up the Tar Heels-Spartans Monday night match. And I had fallen back to 10th place in the office pool, behind nine people who picked North Carolina to win it all, including Phoebe and my mother. For the record there were 71 entries in our pool this year. Prior to the championship game, our pool master dispatched a message announcing that if North Carolina won, a mom-to-be would win our pool. If Michigan State won, new dad, me, would win our pool. "No matter who wins," he said, "the money will probably be spent on diapers." Never mind Michigan State was headed for a Tar Heel blue wall of Ty Lawson and Tyler Hansbrough ... That team was on a mission to avenge the beating they got from the Jayhawks in the Final Four last year -- which was really fun to watch, by the way -- and Hansbrough wasn't heading to the NBA without winning a national championship first. With the Spartans down 55-34 at halftime, somehow I held to hope that Michigan State would step it up, take care of the ball and make a run in the second half ... But the mistakes continued, and we shut down our party a few minutes into the second half. We went to bed and didn't bother staying up to watch the blue and gold confetti flying at the end. Our office pool ended up going to the mom-to-be, and I finished in 17th place, out of contention for any earnings and behind the 16 people who picked North Carolina to win it all. Phoebe finished in fifth place, just four points out of the money; my mother finished in seventh. Speaking of Hansbrough ... It was something special to watch him play the last few years. Period. ... On Sportscenter this morning I overheard one analyst call him one of greatest college basketball players ever; I have to agree. I had the day off from work today. And it's baseball's opening day. I caught the Rangers beating up on the Indians. Then, I watched gleefully as CC Sabathia and Mark Texiera struggled and the Yankeees lost their opener. And now we're watching the Cubs opener in Houston before catching college basketball's national championship game a little later. Last night I was all over the Philadelphia-Atlanta opener on ESPN. Seeing and hearing Jon Miller and Joe Morgan back in the Sunday Night Baseball booth was music to my ears. Not so happy to see Steve Phillips joining the team this year, though. a Ace Zambrano Wants Cubs To Abandon Wrigley Field ... From the Are you kidding me!? file. Support your local record shops! I feel so lucky to have a couple really groovy record shops in our parts ... And they look just like some of the shops in this video. My friend Laura sent me this today ... It made both of us cry. Oh, Megan, Megan, Megan. It was fun while it lasted. But your performance last night was awful ... Tonight, you were just downright annoying. And what were you thinking, disrespecting Simon!? You never disrespect Simon. Aside from the usual drawn-out eliminations … Did anyone else notice the flipped image of Megan in the opening montage? Her tattoos were totally on the opposite arm and I caught that one IMmediately … Also, good to see Alexis Grace sitting in the audience. But sitting next to Jason Castro? … Nice of Paula to give the contestants the be-confident-in-who-you-are-and-go-after-it speech. Too bad the judges smash the contestants for actually being themselves. Ahem, Matt Giraud … Loved the group performance of Journey’s “Don’t Stop Believing.” Scott MacIntyre at the keyboard and hello, Megan -- where was that stellar vocal for your individual performances!? Adam Lambert is beginning to run away with this thing … We didn’t like him at first, and he’s probably not the type of artist we’d listen to on a regular basis. But each week, he’s managed to come out with stuff that’s far more original and fresh than anything else on the stage. And Simon said as much in his critique. And you can mark down Kris Allen as the runner-up with the way he’s going. His take on “Ain’t No Sunshine When She’s Gone” was a charmer. They all can go and let's just do the finale next week with Adam and Kris. Ok, we can throw Danny Gokey in there, too, for good measure. Ok, and Allison, too.